CKX Inc., parent of “American Idol” producer 19 Entertainment, and owner of the rights to the names, likenesses and images of Elvis Presley and manager of Presley’s Graceland, has signed its new chief executive, Michael Ferrel, to a contract that runs through 2013. Ferrel, who succeeded CKX founder and Chief Executive Robert F.X. Sillerman, has signed a deal with a minimum base salary of $1 million per year through February 2013. Details of the accord were disclosed in a Securities and Exchange Commission filing by CKX. Ferrel had been a senior CKX executive several years ago who returned as acting chief executive in May after Sillerman resigned. Myrna’s kidneys are not functioning properly and she is on dialysis. The dialysis treatments are very hard on Myrna and have made her weak. 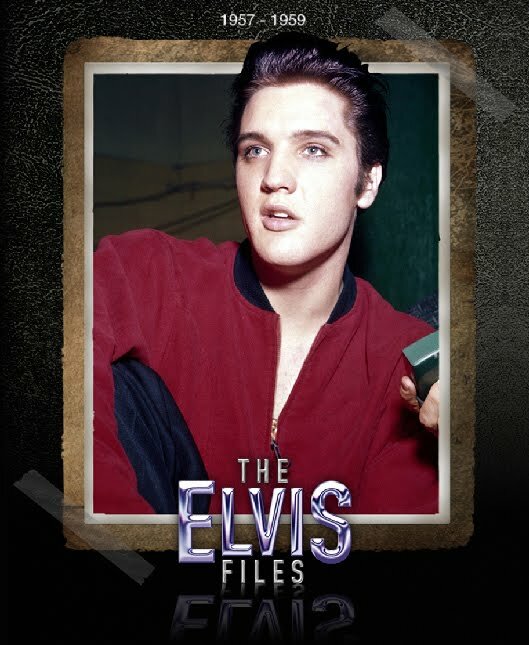 The Norwegian Flaming Star fan-club announced the cover-art of Erik Lorentzen’s Elvis Files, Volume 2. This part handles 1957-1959. The “Dead Rich List” was published. Who earned the most from beyond the grave? Elvis Presley is of course the main earner with over £1bn. Elvis’ estate has generated many millions from music royalties, DVDs, licensing deals and tourism at Graceland since his death in 1977, aged 42. This year, his estate earned £36million. Presley’s Graceland mansion is the second most-visited home in the U.S. after the White House, raising £18million a year. His estate also has a large collection of licensing and merchandise deals. He has appeared posthumously in adverts for everything from Apple’s iMac to Lipton’s Tea. There is even a newly-released collectors’ edition of a Jailhouse Rock-themed Barbie doll on the market. His former wife Priscilla has built an extraordinary business from the King’s ashes. She and her daughter, Lisa-Marie, are the main beneficiaries of the estate. Graceland archivist Angie Marchese was cataloging receipts and other paperwork from Vernon Presley’s Graceland office about two weeks ago when she found a manila envelope with three photo negatives. “Just when you think you’ve seen everything, all of a sudden there’s something new,” said Marchese. 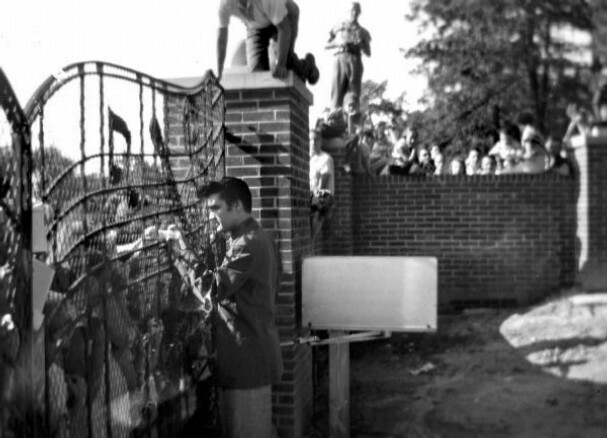 The negatives were photographs of Elvis Presley greeting fans at the newly installed gates of Graceland in 1957 while others literally climbed atop the walls for a better look. No one knows who shot the photographs or the exact date, but the gates made their debut on April 26, 1957, before Elvis or his parents moved into Graceland. The house was being renovated before Vernon and Gladys Presley spent their first night there on May 16, 1957. Elvis, who was filming “Jailhouse Rock” at the time, didn’t spend his first night at Graceland until June 26, 1957, but he visited while the work was in progress, says the archivist. Each of the three photos is similar, but shot at slightly different angles. The last major find of unseen Elvis photos was in 2006 when another file cabinet in Vernon Presley’s office yielded eight negatives of Elvis filling out paperwork for his 1958 Army induction. “Vernon never threw anything away,” said Marchese, estimating his office may hold more than 1 million documents and receipts. The three newly discovered photos were reproduced as 4-foot-by-4-foot posters to be installed today in the Elvis Lives Museum in the Graceland Plaza shopping complex. Marchese said there is no way to place a value on the photographs. Elvis’ music was played very often on the radio in 2009. SENA, the organisation that takes care of the rights for artists and producers, published a list of entertainers that can be heard most on the radio. This entry was posted in 06 - June. Bookmark the permalink.